Hello there. Been a bit silent on the old blog front in the last month. Sorry about that. It’s been rather work-tastic, which has been excellent, but keeping me from writing about of the stuff i’ve been up outside of work in the last few weeks. The most interesting thing i’ve seen has easily been Decode. It’s on at the V&A until April, it is only a fiver, and YOU NEED TO GO. It is the kind of thing that Lauren would fall head over heels in love with, were she still in London educating ignorant people like me about the wonders of contemporary art. Me, I liked it because of all the interactivity and bright colours. But then, i’m a simple beast (albeit one who likes to do star jumps when an exhibition calls for it). I’m not going to go into detail about the specifics of the exhibits (We Feel Fine was there, natch, as was the video/visualisation for a Radiohead song – House of Cards), but suffice to say, they were a glorious mixture of the fantastic, the obscure and the intriguing. And a few of them were broken, but it made me feel less intimidated and less like a luddite. No, what i’m going to talk about is the booklet I snagged from there, which features interviews with a few of the leading exhibitors. It really opened my eyes about how certain segments of the art world are facing the same debates as the comms world – about physicality, of how information is managed and dealt with, and how to manage the blurring between logic and magic. (NB: I’m not claiming communication is art, or even getting into that debate right now…heh). Now, this is interesting. I can barely code, but like to think I have a reasonably firm grasp on just what to look for in a good piece of communication (digital or otherwise). I do think there are those who don’t have much of a digital mindset – by that I mean a lack of an appreciation that pieces of communication are there to be useful, to be shared and to be inclusive. The facility for identifying this in pieces of communication, or to be able to tell when a tool presents a new opportunity – those are the traits which I think should be valued above all else. Thinking about the space in which things are going to be consumed, how cross pollinated things will be, how contrary people are, how likely things are going to be played with and remixed – those are skills which should always be applied. Slapping a tired old demographic on something, or a hackneyed, banal cliche – that’s the enemy of lateral thinking. 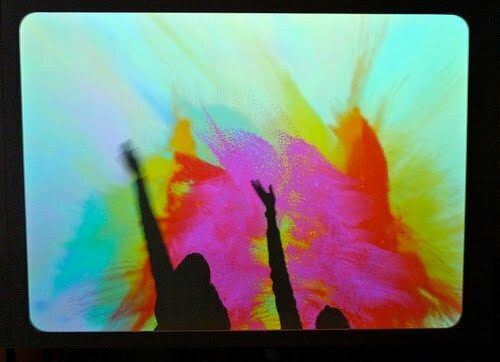 Decode taught me that – you had grandmothers doing a dance to change the colours, and small children acting INCREDIBLY seriously around pieces of interactive art (as if they owned it, and it was only performing for them)…it opened my eyes a bit.